This is a section of a prayer by Thomas Merton called Thought in Solitude. 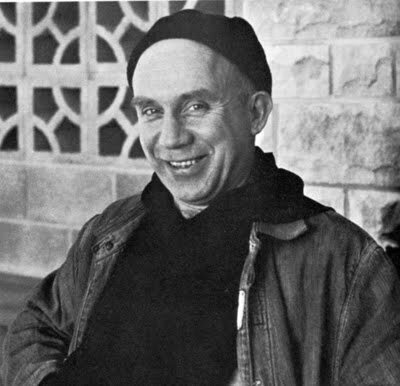 Merton was a Catholic monk living at the Abby of Gethsemani in rural Kentucky from 1941 until he died in 1968. Over the last two years Merton has become one of my favorite spiritual writers, this section of his Thoughts in Solitude in particular. I do not know where I am going or what God has planned for me. But I hope to follow the path that He has set for me. Merton’s prayer goes on to say “…I believe that the desire to please you does in fact please you. And I hope I have that desire in all that I am doing…” I do not know where I am being lead life. What path my life is being directed on. I do know that I am being called to make a difference in the world and I will do all in my power to follow that call. I believe that we are all placed here with a specific purpose and we are shown that purpose slowly and quietly, like a whisper. If you would have asked me two years ago where I would be today I would have told you at grad school studying to get my Master’s in Education. I am a planner. I always have plan A and B. I had my whole life planned out my freshman year of college; get a BA in history so I can teach on the high school level, find the perfect guy, get married and settle down, start a family. In my eyes my life was mapped out, set, not going to change. Life is funny though. I truly believe God laughs and shakes his head at people like me who think that we are in control. We sit and plan and we don’t want any changes in our plans. It doesn’t work that way. From the start He has had bigger and better plans for me I just did not know what they were. I still don’t but I have a few pieces of the puzzle. One moment, one phone call. While I was home for the weekend, my sophomore year, my mom told me that she had very important news for me but I had to wait until my sister got out of school. We were sitting in the car waiting to pick her up. The phone rang. The only word in the conversation I caught was adoption. My parents couldn’t possibly be adopting, or so I thought. I was the oldest of four kids already and my parents were in their late forties. Why would they want more kids? Their youngest was 10. I was wrong. My parents began the adoption process for Haiti in January of 2010 after the earthquake devastated the country. One man a few months later. God placed Jean-Robert Cadet in my family’s life. Cadet was born in Haiti to a white man and a black woman. Cadet was given away by his father as an infant to another woman in Pout-au-Prince. He grew up as Restavec, a domestic child slave, in Haiti. Restavec is a creole term that means “to stay with.” He was treated worse than a dog, made to sleep under a table, his childhood taken away from him. For the first time I realized how close modern-day slavery was to me. Today Cadet is a Middle-Class American fighting to end the Restavec system in Haiti. Meeting Jean-Robert was the first piece in my life puzzle. One picture, one look of hope. Cadet told my parents that he could find us a child to adopt. Not one from an orphanage, but one who was on the street, who could be in danger of becoming a Resavec. In August that year my mom sent me an e-mail and two texts to check my e-mail ASAP. There smiling back at me was a six-year-old girl. Things began to be set in motion. T’s father was still alive, along with her older siblings. She was getting one to two meals a week. Her legs were covered in sores from the poor water conditions. She didn’t have clothes that fit her and her dad could not afford to send her to school. He wanted a better life for his youngest daughter. So Cadet asked a friend of his to become a foster mom for T until we could bring her to Kentucky. Everything was planned, set, or so we thought. One surprise, one look of sadness. T had a sister who was eight. My parents received another picture, this one of J clinging to T with a look of fear and longing. God had bigger plans for my family then we thought. We would have 2 new additions not just 1. J was 10 she is the taller of the two girls. T was 6. This picture was taken the day Cadet went to take T to the foster mom.